Aerial photo of Second Beach, 1930s. Source: City of Vancouver Archives, AM54-S4-: Air P104. Writing and publishing a book is a long process that often requires authors and editors to make tough choices, especially during the revisions process. We add new material, alter existing sections, and cut, cut, cut. One of the most difficult parts of the process can be the decisions about images. I recently published my first scholarly monograph, Inventing Stanley Park: An Environmental History. Stanley Park is one of the most photographed landscapes in all of British Columbia and the City of Vancouver Archives and Vancouver Public Library hold incredible collections with thousands of images of the park. Thankfully, UBC Press was more than willing to include dozens of high-quality photographs. However, not every picture made it into the book. The press accepted almost all of my proposed images, but after I submitted the final manuscript, I discovered more. Here are five amazing photographs of Stanley Park that I wish I had included in my book. You don’t get the complete sense of the beauty of this panoramic photograph unless you click through to its full-sized image. This is a photograph of the construction of the Coal Harbour causeway. In 1909, the bridge across Coal Harbour collapsed. This prompted the Park Board to seek new designs for the Georgia Street entrance to park, an area long thought to be unsightly due to the shifting tides which left the western basin of Coal Harbour drained and muddy. Pauline Johnson admired this tidal phenomenon and named the basin Lost Lagoon. The board sought to either fill in the basin or permanently flood it with an artificial land bridge or causeway. Following an acrimonious public debate over the designs of famous landscape architect Thomas Mawson, the Park Board elected a simple naturalistic causeway plan, designed by city engineer Frederick Fellowes. 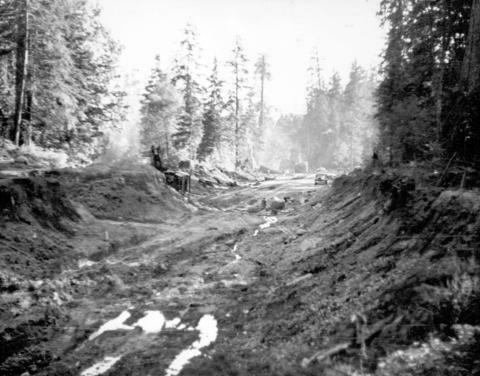 While I did include a photograph of the clearing cut through the forest to build the highway to Lions Gate Bridge in my book, it did not fully convey the extent to which this roadway scoured out a trench through the middle of the park. In later years, park commissioners would refer to this as a scar on the face of Stanley Park. I also like the parallels between this photograph and images from the late 1880s of the construction of the first park road. 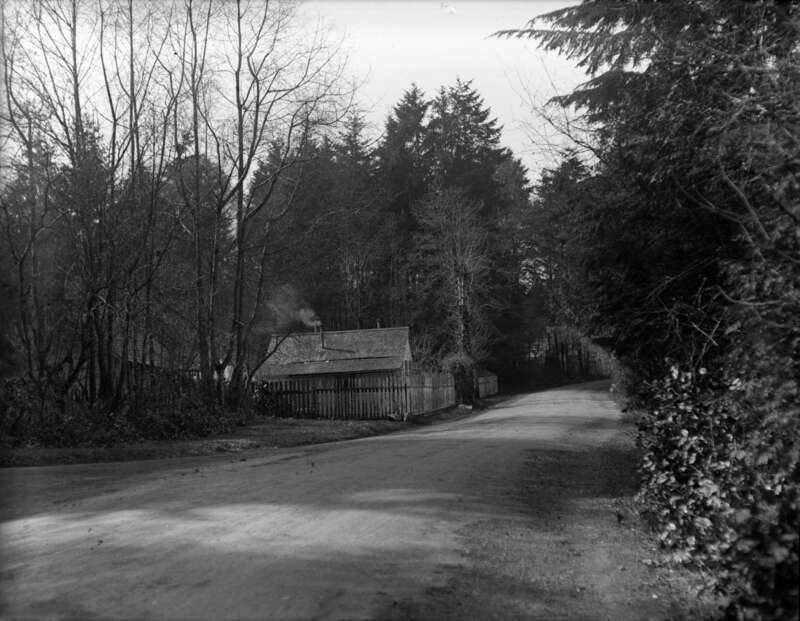 Just as in the national parks, road-building played a significant role in landscape transformation in the history of Stanley Park. I did not examine the beaches along the shores of Stanley Park nearly enough in my book. 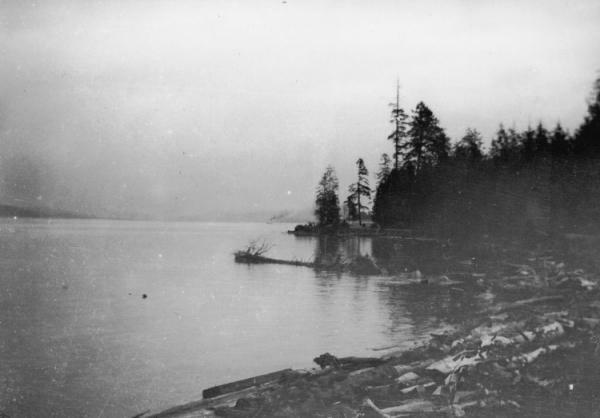 This photograph of Third Beach in 1890 vividly illustrates the massive transformation of the shoreline of Stanley Park that occurred over the course of the twentieth century. One of the central arguments of my book is that humans altered the ecology of the Stanley Park peninsula more substantially after it became a park in 1887 than any other time in its history. This part of the park is now a sandy beach enclosed by the popular seawall. It no longer exhibits this rough, log-strewn appearance. This photograph was taken just a couple of years following the Supreme Court of Canada trial that led to the legal eviction of the Brockton Point villagers, a community of mixed Aboriginal-European settlers who had lived on the Stanley Park peninsula since the mid-nineteenth century. I explore this case in my book, but Jean Barman’s Stanley Park’s Secret goes into much more detail. This photograph illustrates a point I try to make in my book regarding these so-called “squatters.” City officials used the term “squatters” as a way of implying that the families who lived at Brockton Point were illegitimate transients who lived in shacks. These photographs, however, reveal that their houses were permanent, well-established dwellings. This was the home of Tim Cummings, the last person to live at the Brockton Point village. This is one of several incredible early aerial photographs of Stanley Park. These images provide excellent evidence of some of the broad-scale landscape transformations of the park. During the course of my research, I was surprised to learn just how much the Park Board altered the environment of the Second Beach and Ceperley Meadow areas of the park. This is the isthmus that connects that Stanley Park peninsula to the rest of downtown Vancouver. Prior to the 1910s, this area would periodically flood at high tide, leaving Stanley Park an island. Beginning in the 1910s, the Park Board pumped fill from the bottom of English Bay onto the isthmus to raise it and prevent it from flooding. You can see in this image just how sparsely forested this part of the park was in the 1930s. 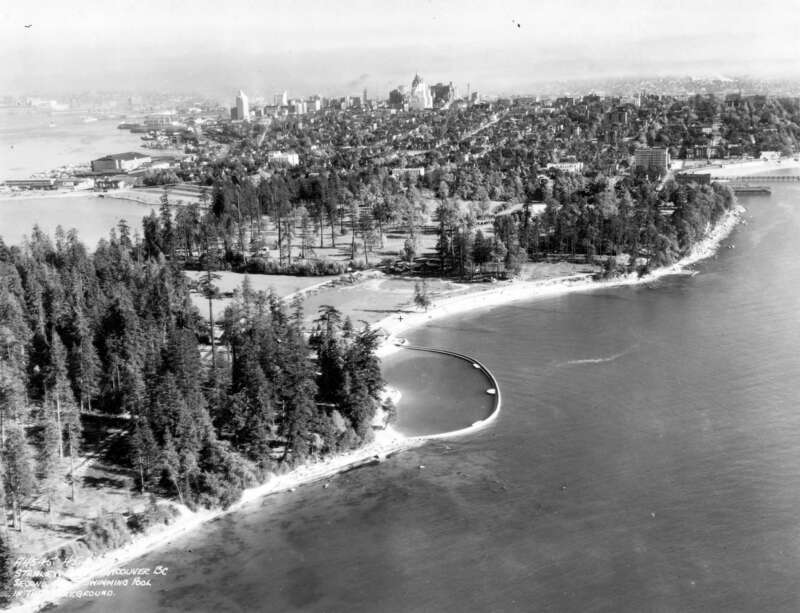 Because the trees in this area tended to be sparse and often fell during wind storms, the Park Board built a number of recreational facilities in this part of Stanley Park, including tennis courts, an elk paddock, a golf course, picnic grounds, and a bathing beach with a saltwater swimming pool. While I did not included these five photographs of Stanley Park in my book, you can still find dozens of great images of the park in Inventing Stanley Park. With such an immense photographic record, visual evidence played a very important role in my research, but there are only so many pictures that can fit in one book.